The holiday season is “make or break” time for retailers, accounting for up to 30% of annual revenue. Retailers face a host of challenges: mega competitors like Amazon, the rise of social platforms and the relentless flood of data that can drown an organization. Data is the solution to delivering the real-time, hyper-personalized experiences and comprehensive understanding that consumers are demanding. But how do you take this mountain of data and turn it into true, data-driven relevance that will delight holiday shoppers and turn them into buyers? Find out in this special guide from the customer experience experts, Digital Clarity Group. Will it be “Ho, Ho, Ho” or “Oh, no, no” for retailers this holiday season? While the season is as important as ever — accounting for over 30% of annual revenue for some retailers — it’s getting ever harder to master, given the combination of budget constraints, tired infrastructures, changing consumer expectations, and nimble, unpredictable new competitors. One thing is sure: Summer is the time to start preparing. The challenges for traditional in-store retail are many, and they are growing in intensity. Primary among these are dedicated e-commerce sites (especially Amazon), social platforms (especially Facebook), the pressing need to integrate physical stores with digital services, and the relentless flood of data that can drown an organization. The first three of these challenges are like Grinches set on spoiling the holidays for retailers. In contrast, the wealth of knowledge and insight harbored in the customer data that flows through a retailer’s myriad marketing, sales, service, and other internal systems is potentially the solution for a happy holiday outcome. When aggregated, understood, and acted upon smartly, this data can deliver something that is beyond the ability of the challengers – i.e., a truly comprehensive customer understanding that provides not just personalized offers or content but assistance, understanding, and relevance. In this report, we analyze each of the holiday retail challenges in turn in order to understand their most seductive and attractive features, which can potentially be imitated and improved by retailers. We then consider how the strategic use of data can support highly relevant relationships with consumers and ensure a happy holiday season. In short, mobile devices allow consumers to eliminate any distinction between online and offline shopping. The future of (holiday) retail shopping is literally in the hands of consumers, as the mobile device becomes an indispensable shopping companion that provides information, comparison pricing, access to the opinions of friends, and much more. The future of holiday shopping is literally in the hands of consumers, as the mobile device has become an indispensable shopping companion that provides information, comparison pricing, access to the opinions of friends, and much more. Of course, it’s not the physical device itself that matters, but the sites, apps, and services that it makes available. Mobile has such a large impact on retail because these services profoundly reduce the friction involved in shopping for, buying, and receiving goods. Consumers no longer have to make a choice between the convenience of buying from home and the assurance of handling the product in a store. Buying on a device while in the store (as 22% reported doing in one global survey) can allow a shopper to avoid long checkout lines or dealing with cash. Shipping options like BOPUS (buy online pick up in store) mean that delivery can finally be organized around the life of the customer rather than the opposite (as has been the case for decades). From the retailer’s perspective, it shouldn’t be about some vague notion of replacing siloed channels with an omnichannel experience. All that really matters is serving customers’ needs and helping them achieve their goals. It’s all about providing real-time, highly personalized, and genuinely helpful insights, information, and incentives. When asked what benefits they expect in exchange for providing personal data, consumers typically name those that reduce friction and promise more relevant interactions. (See Figure 1.) The words relevant and relevance mean “pertinent to the matter at hand.” They are derived from a word in old French that could mean “helpful,” and are traced back to the Latin expression for “to lighten or lessen the load.”10 Helpful, pertinent, lightening the load – that’s precisely how retailers should aim to be perceived by shoppers. These are the characteristics that will result in your services (whether digital or in-store) being used, admired, and promoted. Anyone who wants to provide relevant assistance thus needs to pay very careful attention to the context – which means both what the consumer is trying to achieve and where they are in the journey towards that goal. This is where retailers may have an unfair advantage over digital upstarts like Amazon and Facebook. The breadth and depth of data available to a retailer can be massive – from sales, customer service, loyalty programs, marketing and promotions, interactions with store associates, etc., to pertinent non-customer data such as inventory levels, shipping, and supply chain. The first task is to determine what first-party data exists and where it is. The second is to access, aggregate, and understand it. The third and central task is to derive the actions that are appropriate to provide relevant assistance to shoppers in real-time in support of their goals – thus increasing the likelihood that they will choose your services over a competitor’s. (See Figure 2). This is data-driven relevance. When done right, it can win the hearts and wallets of consumers who seek and reward superior customer experiences. It’s not an overnight fix, and retailers should take the first steps well before the holiday season. In the next section, we’ll analyze three main holiday challenges for retailers and then see how data-driven relevance can help retailers learn from, leverage, and respond to each. As they prepare for the next holiday season, retailers face three main challenges: Amazon (and other e-commerce specialists), Facebook (and other social platforms), and impact of digital on the in-store experience. Amazon is like an irritating distant relative who shows up for Thanksgiving dinner, grabs the best parts of the turkey, controls the conversation, and refuses to leave. Beyond search, Amazon received over one-third (34.5%) of all U.S. retail website visits in December 2015, which is more than the total of the next fourteen retail sites.12 It only gets worse when the money meets the cash register: Amazon captured nearly 43% of all U.S. online sales during the holiday season. That’s ten times more than second place Best Buy; taken together, the next ten retailers accounted for less than 25%. The Relevance Response: With the possible exception of Alibaba, no retailer in the world can hope to match Amazon’s scale and compete with it on its own terms. The strategy should rather be three-fold. First, strive to match the convenience that Amazon offers with painless, one-click checkout, fast shipping, and easy returns. Second, raise the stakes on Amazon by leveraging physical stores as distributed, flexible warehouses for pick up and returns – both of which offer cross-sell and upsell opportunities. In fact, a recent study found that consumers who visited a physical store for pick up or return left with 107% of their original basket size – unheard of behavior in an online environment. Third, and most importantly, beat Amazon at its reputed best by drawing on your extensive customer knowledge. The fact is that Amazon’s much touted recommendations and associated offers are rather dumb. Besides asking if a product should be gift-wrapped, Amazon has little way of knowing whether it was purchased for the buyer or someone else, and subsequent recommendations can be far off the mark. A retailer that is drawing data about multiple customer interactions across various channels and touchpoints can make far more intelligent and relevant suggestions. Facebook is the irresistibly attractive and deeply mysterious stranger at the company Christmas party that retailers can’t help falling for, even though they should know better. But then, that’s what makes Facebook such an ideal place for brand advertising. If consumers are staring at their phones rather than glancing at a billboard or reading a magazine, then that’s precisely where you want to be. And rather brilliantly, Facebook’s latest innovations (such as Facebook Canvas) have been largely about helping retailers monetize that huge captive (and captivated) audience with direct response advertising and product browsing as well. (These are especially effective in the holiday season, when people do have clear intent – to find gifts – even during their down time.) In the battle against Amazon, Facebook is retail’s indispensable and irresistible ally. The Relevance Response: One of life’s rules: Don’t build your house on rented ground. If Amazon threatens to steal away your customers, Facebook proposes to leave you the customer (for now), but steal away the data about them. 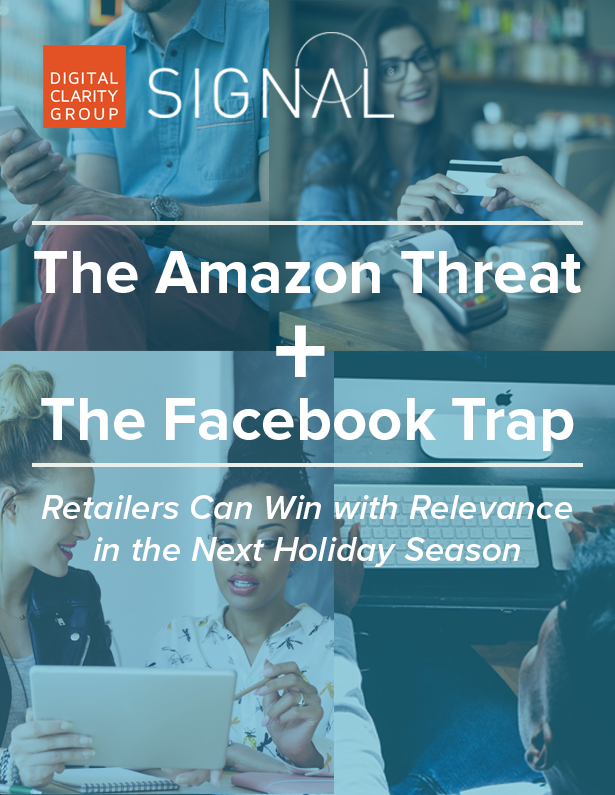 For the holiday season (and right around the calendar), retailers should take every advantage of Facebook’s massive and target-rich hunting grounds, but always aim to “bring them back alive” – to your own properties. That’s not only for the sake of the transaction and the data but also, more crucially, in order to maintain the relationship and sustain the conversation with individuals and audiences. Remember Target’s 2015 holiday success? The retailer increased spending for Facebook and other social platforms by 30% over 2014. Up to 70% of those placements (including Facebook Canvas) focused on driving traffic back to Target.com, Target apps, or physical stores – with the remainder devoted to brand advertising. Bottom line: If you want to marry Facebook, make sure you get custody of the kids. Retailers can win by treating stores as distributed, flexible warehouses. But they shouldn’t feel like warehouses when customers show up. The Challenge: The inexorable growth of e- and m-commerce is reducing store visits and foot traffic – down 6.4% for the 2015 holiday season and as much as 10% for the year, according to RetailNext. That shift is doubly disruptive: online shoppers spend less, and e-commerce doesn’t encourage the browsing and discovery behavior that is possible in a store. It’s not just about the ostensible “death of the mall,” either. Consumers are now generally far better informed and further advanced in the buying journey. When such “committed shoppers” do show up in a physical store, the personnel have to be equally or better informed, and the ambiance should appeal to the consumer’s growing desire for digital engagement and experience, not just a cash register transaction. Smarter Stores: Consumers don’t leave their digital savviness outside when they enter a store. With over 80% of shoppers using their phones as active companions while they shop, retailers should stop worrying about “showrooming” and concentrate on how the store itself can become a part of the conversation with the shopper and her phone. Beacons are the most talked about recent innovation, but retailers should not use them as simple proximity sensors that spew out offers and coupons to nearby devices. Rather, where consent has been granted, beacons and other sensors could trigger a highly relevant interaction with the customer based on recent purchases, loyalty level, or even – via RFID – the unpurchased articles they have in their basket. Oh, and it goes without saying that the wifi should be reliable and free, and require no logon. Better trained employees: A recent study by A.T. Kearney indicates that many retailers may be overinvesting in the latest gadgets while overlooking the most important store feature: employees. Given consumers’ virtually unlimited access to information, store associates must constantly keep up to date with the store’s own selection as well as that of the competition. (Hint: Move beyond the break room newsletter by building a “daily update” app that employees can study at their leisure.) For the sake of convenience and speed, employees should be able to check-out shoppers on the floor, place online orders, or fill online orders from store inventory. Of course, such services should also be informed by the individual customer’s comprehensive profile in real-time. Hyper-customized online shops: If some shoppers are no longer coming to the store, take the store to the shoppers. That is, explore ways to encourage and support the in-store browsing behavior in the online environment. But careful: While in-store browsing might involve wandering around until something catches the eye, online discovery can be suffocated by too much choice – especially on a small screen. Consider displaying less and offering relevant “surreptitious encounters” in the online shop – based on the accumulated customer insights. Getting smarter with stores, associates, and online shops depends upon data – the first and last(ing) gift of the holiday season. There’s really only one way forward for retailers. Given the strength of Amazon, the appeal of Facebook, and the slow but irreversible shift to online shopping, retailers have to be laser-focused on building and nurturing tight relationships with customers on an individual basis. While it’s often said that few people really want to be “friends” with a brand or a shop, everyone does appreciate and prefer a seller that offers convenience, reduced friction, and helpful, trustworthy interactions. Insufficient data: More accurately, the problem here is insufficient awareness of the data that is already – but not readily – available. Due to siloed systems and teams, legacy storage technologies, evolving business processes, and simple absent-mindedness, few organizations have a complete inventory of the data they already control. Begin with an audit of the types and quality of the data the organization has or could acquire. Don’t stop with the usual suspects – websites, social interactions, transactional data, etc. Rather, think about every channel and/or device that customers use to interact with, communicate with, or simply get information from the firm, and ask what are the barriers to accessing and using the data. For example, over-reliance on cookies for identifying website visitors can lead to data loss in our increasingly mobile-first world. Non-unified data: This is the primary technical challenge. Drawing on data from multiple repositories and systems, with various operating systems and programming languages, will be difficult if not impossible without some kind of agnostic data layer. Moreover, this data layer needs to access, accommodate, and aggregate input from multiple devices and both online and offline interactions, in order to comprehend the entire customer journey. The aim is not only to work easily across various systems but also to prepare the aggregated data for real-time actions. Look as well for vendors that can offer a flexible, open, cloud-based solution. 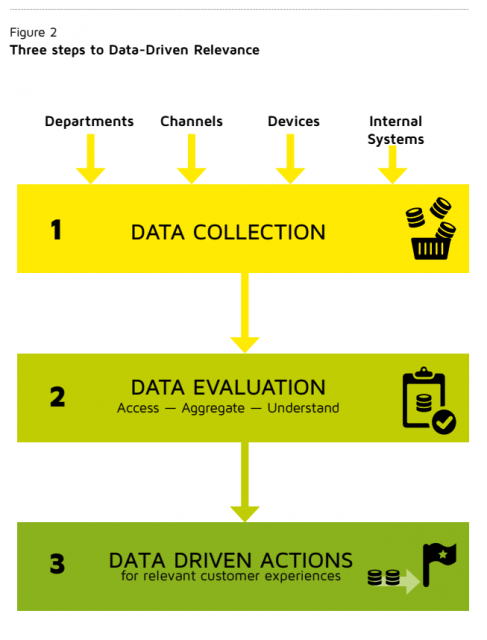 Inability to act on data: Since the goal is to deliver relevant content, offers, and actions for a given consumer, all of the data has to be quickly and reliably related to a secure and persistent identifier. To be useful, the system has to be able to recognize a given user across multiple devices and interactions, to respond in real-time, and to constantly update the profile according to the “conversation” that is occurring with the customer. Data-driven marketing relevance goes far beyond the usual holiday campaigns and promotions – in the effort required as well as the benefits that can be derived. It’s never too early to start, in order to prepare, implement, and test the solution well before the holiday season. Retailers that enforce technology and process lockdowns for the holiday season in October should start the data review by midsummer. With the data layer in place, the holidays will add more data, driving more insights, building more complete profiles, and positioning retailers to build better and deeper relationships in the future. ©2010-2019 Signal. All Rights Reserved. Unauthorized use, distribution, and/or duplication of this material without express and written permission from this site’s owner is strictly prohibited.